Edgar Allan Poe? Germaine de Staël? Bert Leston Taylor? Charles A. Dana? Anonymous? I do not believe in ghosts, but I am awfully afraid of them. I don’t believe in ghosts, but I’ve been running from them all my life. I don’t believe in ghosts, but I don’t want to see one. The master of the macabre Edgar Allan Poe sometimes has received credit for the second statement. Would you please explore this group of jokes for Halloween? Quote Investigator: There is no substantive evidence that Edgar Allan Poe employed one of these quips. When Holland’s book was reviewed in “The London Quarterly Review” 2 and “Blackwood’s Edinburgh Magazine” 3 the remark from Madame de Staël was reprinted which widened its distribution. John B. Bogart? Charles A. Dana? Amos Cummings? Horace Greeley? Jesse Lynch Williams? Billy Woods? Doc Wood? Alfred Harmsworth? Lord Northcliffe? Joseph Pulitzer? Anonymous? When a dog bites a man that is not news, but when a man bites a dog that is news. This saying has been credited to several newspaper people including: John B. Bogart, Amos Cummings, and Charles A. Dana who all worked at the New York Sun. The British press baron Alfred Harmsworth who became Lord Northcliffe has also been named as the originator. Then he would open up, put them at their ease, discourse interestingly about the traditions of the office, and fascinate them, as he could anyone, man or woman, who came in his way. Billy always felt better when this was over. The author Jesse Lynch Williams went on to win a Pulitzer Prize for drama. 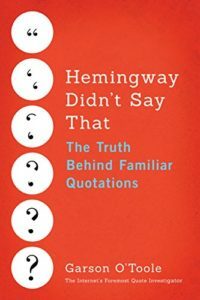 QI speculates that Williams was trying to achieve verisimilitude in his novel by relaying an anonymous witty remark he had heard from within the newspaper business.